It is not the first time that the rechargeable battery of a pair of 3D Vision glasses dies in my hands and it is not the first time I’ve replaced a dead battery (or have revived one that has had its voltage drop below the recommended level). Recently the battery in my very first pair of 3D Vision active shutter glasses has stopped working, these glasses are over 3 years old already and have seen a lot of use, and while the last time I was lucky to have a suitable rechargeable single cell Lithium-Polymer battery available, this time I did not have. 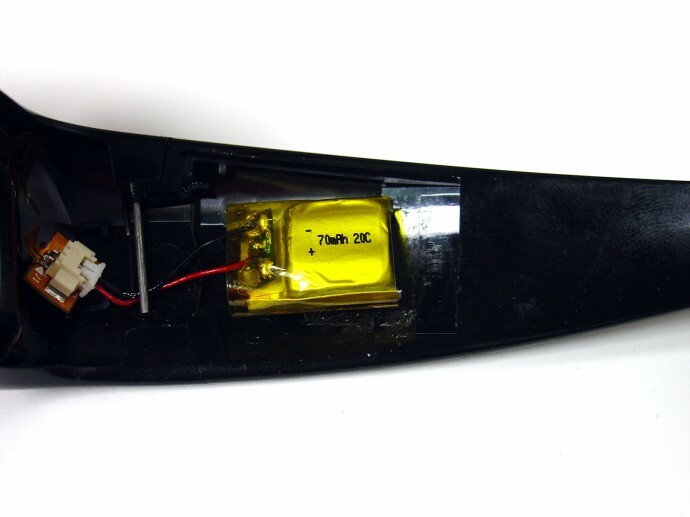 Fortunately, after a lot of searching for a small size single cell LiPo battery with similar capacity to the original battery used in the 3D glasses I have found out some suitable ones. The original battery used in the 3D Vision glasses is a 50mAh 3.7V 1S LiPo and these are not very common and widely used, but apparently some small radio controlled models use similar batteries. The ones that I’ve found out are a 50mAh battery for $2 USD and a 70mAh for $1.84 USD from one of the largest Chinese online store for RC models and parts. Both batteries are very similar in size with the most notable difference being that the 70mAh one is 1mm thicker, but it also fits Ok in the glasses (no need to use double sided tape). At the time I’ve found the batteries only the 70mAh one was in stock so I’ve ordered a few to try them, but at the moment the 50mAh model is also available. To replace the batteries you need to first desolder the old battery and remove the small electronics board that is soldered to the two terminals of the battery, this is a protection circuit that you need to solder on the replacement battery as it does not come with one. Then you just solder back the plus (red) and minus (black) cables to the new battery, recharge the glasses so that the new battery is fully charged and if everything is fine they should start working again (the batteries do come with some charge left in them, so you can test even before fully recharging them). 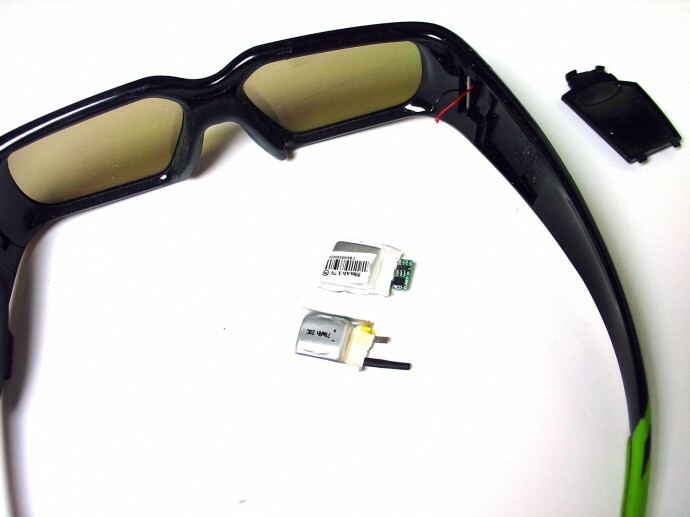 In the end the good old pair of 3D Vision glasses is back in action and it can take up some more use before/if something else fails, the good news is that you can easily do the repair yourself and it will not cost you much, you only need a soldering iron and some basic skills using it. * The numbers in red and green represent the upgrade or downgrade of the specific parameter in the GTX 660 Ti as compared to the GTX 560 Ti! I’ve had a chance to do some testing of the new GT 660 Ti GPU on a Gigabyte GV-N66TOC-2GD card that is one of the first GeForce GTX 660 Ti-based solutions to be available on the market after the official announcement from Nvidia. 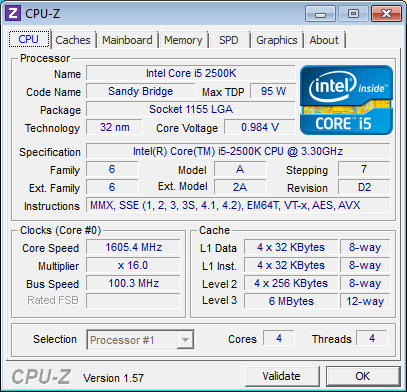 As you can see from the GPU-Z screenshot above Gigabyte has significantly increased the GPU Base and Boost clock frequencies over the stock specifications and you can go even further should you decide to overclock the card yourself – there is room for even higher frequencies. What I like about this card is the cooling solution that Gigabyte uses, it is silent and effective allowing the card to operate cooler and to use the maximum boost clock. 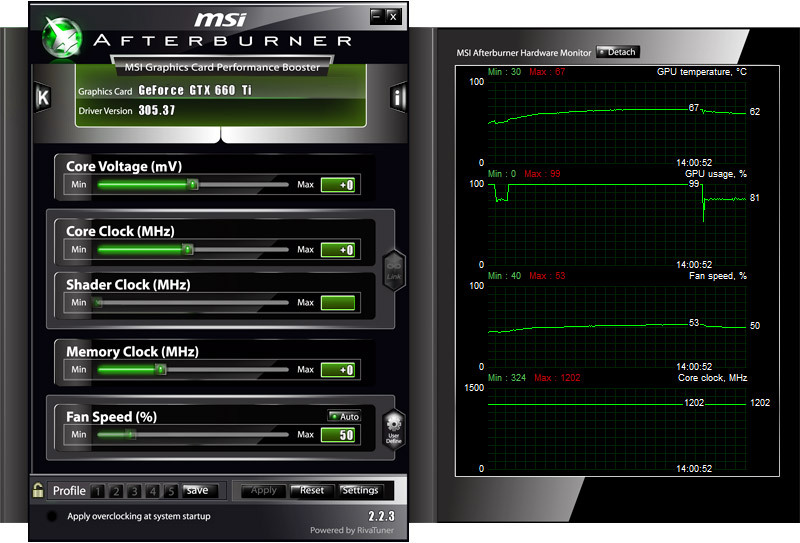 As you can see from the image above taken after playing in stereo 3D mode in Battlefield 3 the GPU is fully loaded, but the temperature remains quite low, the cooling fans operate at low RPM and the card is working really silent, and this allows the GPU to be boosted to 1200 MHz. So Gigabyte has done a really great job with this card. 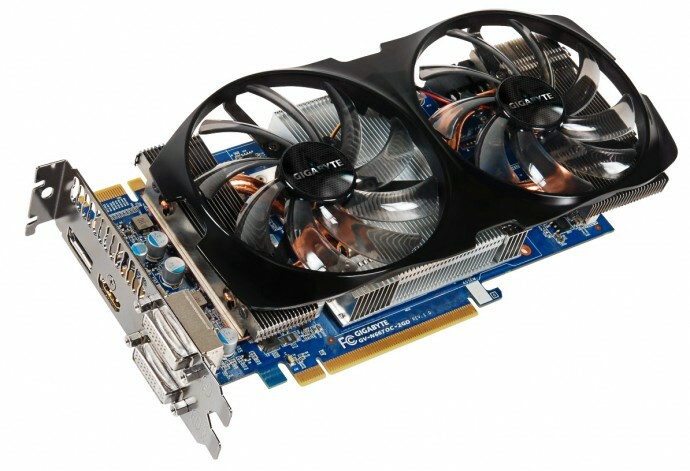 But is the GeForce GTX 660 Ti an interesting product for stereoscopic 3D gamers as compared to the GTX 560 Ti? Until now when I’ve been asked about a more budget oriented video card suitable for stereoscopic 3D gaming I was recommending the GTX 560 Ti as a minimum for a decent experience and a good performance. 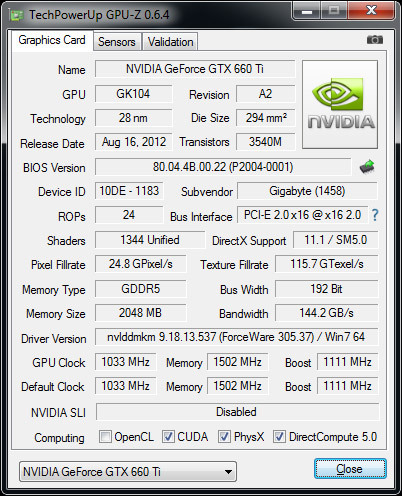 But the GTX 560 Ti can struggle at times with more demanding games in stereo 3D mode at lower graphic details, something that is much less of a problem with the GTX 660 Ti. So my new recommended graphics card as a minimum for stereo 3D gaming is now going to be the GTX 660 Ti, though if you can afford a faster card it will be even better. You should not forget that the GTX 660 Ti is not the fastest card on the market, so don’t expect to be able to push everything on the max with high AA settings in every game and add stereoscopic 3D mode on top of that, however the card is more than capable of providing good framerates even for the more demanding games in High to Ultra settings with no Anti-Aliasing enabled. In the table above I’ve listed the framerate in stereo 3D mode (each eye sees that number of frames per second) you get by using the Gigabyte GV-N66TOC-2GD video card on a fairly high-end system with an Intel Core i5 2500K processor and 8GB system memory. There are two fields for each game, the minimum framerate and the average one, have in mind that when using 3D Vision you are limited to 60 fps per eye, so you cannot go higher anyway. Pretty much only Metro 2033 is still a bit too much for the GT 660 Ti at higher graphics settings in stereo 3D mode, but the game remains playable if you lower the details a bit and not use all the extra features. Of course in more demanding games like Battlefield or Skyrim you cannot go to Ultra settings and push AA filtering in stereo 3D mode, however you may still be able to go higher should you decide to play the games in non-stereoscopic 3D mode. So the GeForce GTX 660 Ti most definitely looks very promising for stereoscopic 3D gaming on more limited budget and the good thing is that later on you could be able to add a second card in SLI setup to get some extra boost in performance and be able to push even higher fps in games even in stereo 3D mode. The GTX 660 Ti is my new must have minimum video card if you plan on playing games in stereoscopic 3D mode with 3D Vision, that is if you really want to have a nice experience and good framerates without having to sacrifice resolution of graphics details. The GTX 660 Ti isn’t going to be much slower when compared to a GTX 670 card, but with a price of about $100 USD lower the GTX 660 Ti is definitely going to be an attractive video card for gamers in general and for stereoscopic 3D ones with more limited resources in particular.